Powers/Abilities: Superhuman strength, able to heal severe injuries extremely quickly, able to fly, x-ray vision, bullet-proof, able to communicate telepathically with dogs, able to absorb knowledge from books at a touch (though he only retains this information for around 30 seconds). 1) Super Breath - Like Superman, Meteor Man can freeze things just by blowing on them. He accidentally discovered this by unintentionally freezing a hot cup of coffee at work. 2) Super Speed - In the movie he protects a crowd from a hail of sub-machinegun bullets by moving to intercept each fired round. 3) Laser Vision - Fired green lasers from his eyes as a clone of Superman's heat vision. Instantly able to fry an egg in a pan or make a large woman think the gangstas next to her are trying to cop a cheap feel. 4) Gesture controlled telekinesis - Through pointing or gestures, those with meteor powers are able to fix a nice cup of tea or lift people throughout the air. 5) Imbue fertility - Meteor Man plants a garden in an empty lot, channeling green energy into the ground. Giant fruits and vegetables grow there overnight to feed the poor inhabitants. Other than fighting others with meteor powers, the only real weakness was that the power got drained over time and with use like a battery. Only absorbing more meteor rocks would restore his powers. History: Jefferson Reed is a mild mannered school teacher in Washington D.C. His neighbourhood is plagued by the local gang The Golden Lords, drug dealers who terrorise the locals. One night Jeff steps in to rescue a woman from the gang, only to end up running from them himself. Hiding in a garbage dumpster, he manages to escape, but as he climbs out of it, he is struck down by a glowing green meteorite which crashes down from the sky. His spine is crushed and he receives severe burns. He awakens several days later in hospital, but when his bandages are taken off, he is miraculously healed from all his injuries. Jeff soon discovers the meteorite has left him with other abilities too, such as flight and superhuman strength. Confiding this to his parents, he is convinced by them to use his powers to try and help his community. 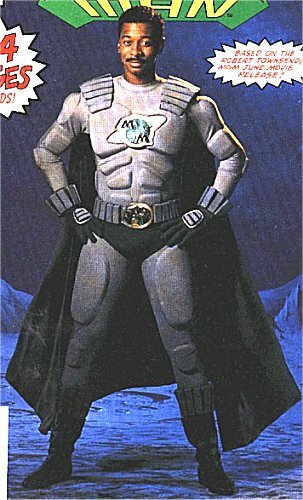 His mother designs a costume for him, and as Meteor Man, he takes on the Golden Lords and their leader Simon Caine. Comments: Created and played by Robert Townsend. 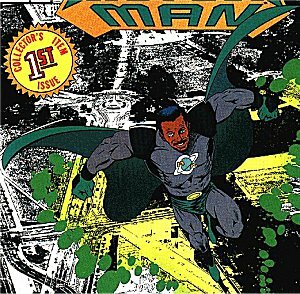 As well as the movie, Meteor Man also appeared in a Marvel Comics limited series, where he encountered Spider-Man (#3) and Night Thrasher, leader of the New Warriors (#4-5), placing him retroactively into the Marvel Universe. Thanks to Derrick Seeto for informing me of additional powers, and Matt Spaulding for informing me of his encounter with Spider-Man.